Penang has been dubbed the food paradise of Asia, and by some even the world, and for good reason. There is a hugely diverse selection of cheap and expertly prepared dishes on virtually every street corner in George Town. There are dozens of food courts where you can sit and have fresh juice, noodle and rice dishes, seafood, ice cream, and assorted snacks for about $1 each. Hawkers are generally very friendly and speak enough English to help you make a selection. 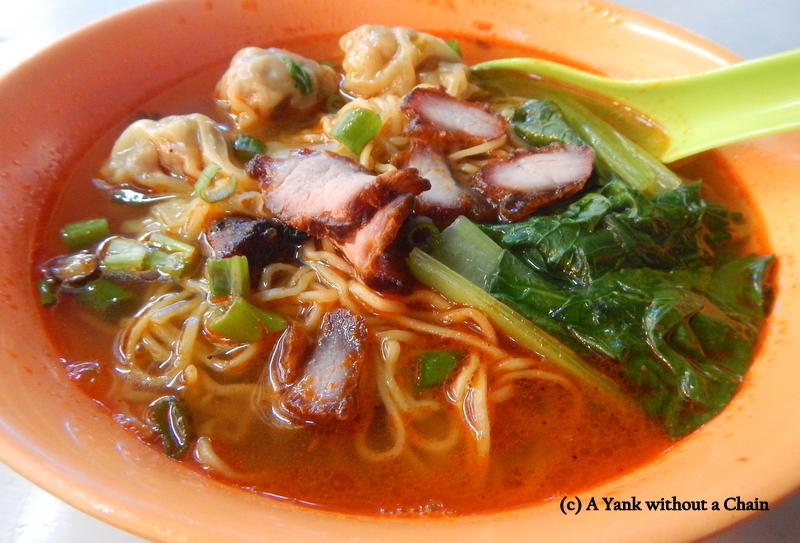 The Red Garden was one of my favorite food courts, and it’s also where Anthony Bourdain went for delicious Wan Tan Mee (noodle soup with dumplings and pork) on No Reservations. Prawn-based dishes such as Penang Laksa and Mee Goreng are what initially put Penang on the map, but honestly they were not my favorites. I’ve never been a fan of that pungent prawn flavor, which reminds me too much of how low tide smells. I did, however, love the dubious-sounding Ice Kacang, which is a shaved ice dessert topped with creamed corn and red beans. If you’re going to eat in Penang, it’s good to remember that nasi means “rice” and mee means “noodles”. That will make reading the menus slightly less confusing. I didn’t give these giant fish heads a try, mainly because they are supposed to serve up to four people! This entry was posted in Malaysia and tagged anthony bourdain, asian food, curry, food, george town, malaysia, Mee Goreng, noodles, penang, Penang Laksa, rice, rtw, travel, Wan Tan Mee. Bookmark the permalink.